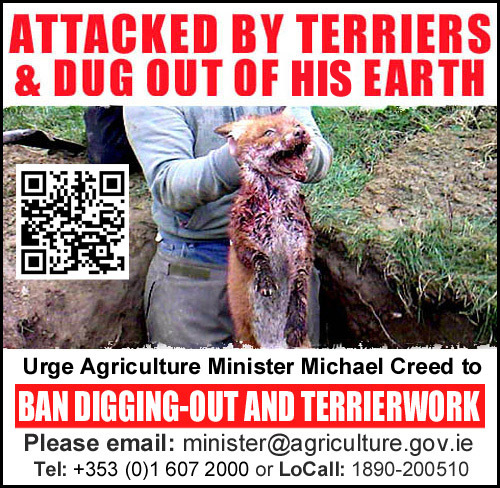 To ask the Minister for Agriculture, Food and the Marine if he will consider an outright ban on the inhumane practice commonly known as the digging out of foxes; and if he will make a statement on the matter. Under the Animal Health and Welfare Act 2013, lawful hunting of an animal may take place unless the animal is released in an injured, mutilated or exhausted condition. There is also provision under Section 25 of the Act for the Minister to establish a Code Of Practice to or adopt, in whole or in part, a code of practice established by another person, whether within the State or otherwise. The Hunting Association Ireland and the Irish Working Terrier Federation have set out rules and procedures for the use of hunt terriers. It is intended that these rules and procedures will be examined in the context of Section 25 of the Animal Health and Welfare Act 2013 with a view to adapting them as modern Codes of Practice under the Act.